Going to a fancy dress or special party? Make a bold statement with brightly coloured eyeshadow and over-the-top paper lashes. Paint your eyelids first in vibrant colours, like blues, greens, yellows and oranges. Then cut lash shapes from old magazines or scrapbooking paper. Fold the bases of each eyelash over to form a rim, then use eyelash glue (or try a simple paste of flour and water) to stick them to your lids. Hold the lashes in place for a few minutes until they stick properly. 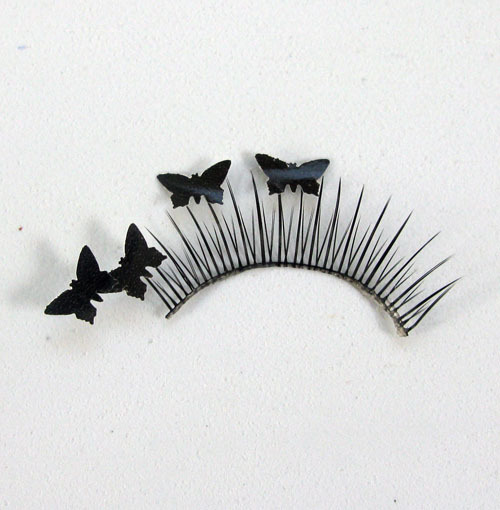 Alternatively, dress up shop-bought false lashes with tiny paper critters (see image below). You can buy cheap false lashes from $2 shops or craft emporiums. Look for a craft punch too. We’ve used a small butterfly punch to punch out butterfly shapes from black paper, which we then glued to the lashes. Attach the lashes as per the manufacturer’s instructions. Then just flutter your peepers and you’ll be the belle of the ball.